Loews Hotels welcomes guests “Home for the Holidays” this season with attractive savings of 20 percent off stays of three nights or more through January 31, 2011. Whether visiting family nearby or looking for a holiday break to relax and recharge, guests will find Loews a true home away from home for the holidays with uniquely local celebrations and festivities. All Loews properties will be trimmed with holiday cheer to make guests feel right at home with activities such as holiday movie nights and marshmallow roasts with festive music playing throughout. Guests can skate on the floating ice rink at Loews Lake Las Vegas; enjoy live musical performances and holiday treats during “The 12 Days of Christmas” at Loews Ventana Canyon (Tucson), participate in a gingerbread house decorating workshop for kids at Loews Vanderbilt Hotel (Nashville) or take a cookie decorating class for kids at Loews Annapolis Hotel. The “Home for the Holidays” package is available at 16 Loews Hotels throughout the U.S. and Canada. Not available at Loews Portofino Bay Hotel, Loews Royal Pacific Resort or Hard Rock Hotel in Orlando. Travelers who book three nights or more will receive 20 percent off the stay their stay, now through January 31, 2011. Discounts are reflected in rate at time of booking. Prices vary by date and location. Package prices are based on double occupancy and are subject to availability; black out dates may apply. For more information the “Home for the Holidays” package or to book, call 1-800-23-LOEWS or visit http://www.loewshotels.com/en/specials/promotions/home. Headquartered in New York City, Loews Hotels owns and/or operates 18 hotels and resorts in the U.S. and Canada, including the newest 414-room Loews Atlanta Hotel opened April 1, 2010. Located in major city centers and resort destinations from coast to coast, the Loews portfolio features one-of-a-kind properties that go beyond Four Diamond standards to delight guests with a supremely comfortable, uniquely local and vibrant travel experience. Loews boasts some of the industry's most innovative and successful travel programs, including Loews Loves Kids for families and Loews Loves Pets for discerning animals on the road. For reservations or more information on Loews Hotels, call 1-800-23-LOEWS or check http://www.loewshotels.com. 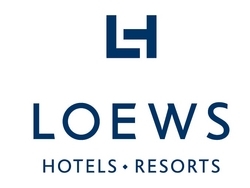 Follow Loews Hotels on Twitter at http://twitter.com/Loews_Hotels. Fan us on Facebook at http://facebook.com/LoewsHotels.